People who follow Perezcope know how passionate I am about early Rolex Sea-Dwellers. To learn more about the amazing history surrounding these watches, I went great lengths and visited Bob Barth – the great American diving legend (US Navy SEALAB) – at his home in Panama City, Florida in October 2017. The earliest version of the Sea-Dweller – the so-called Single Red Sea-Dweller – is a rare bread that does not come to light very often. Therefore it is my great pleasure to present the amazing watch that Phillips has announced for their upcoming “The Geneva Auction: Eight” that will take place on Nov. 10-11, 2018. This magnificent Rolex Single Red Sea-Dweller Ref. 1665 has the earliest case number registered in my database. It is one of less than 15 examples that have surfaced so far! This amazing piece of Rolex history is the true star of the upcoming auction in my opinion. 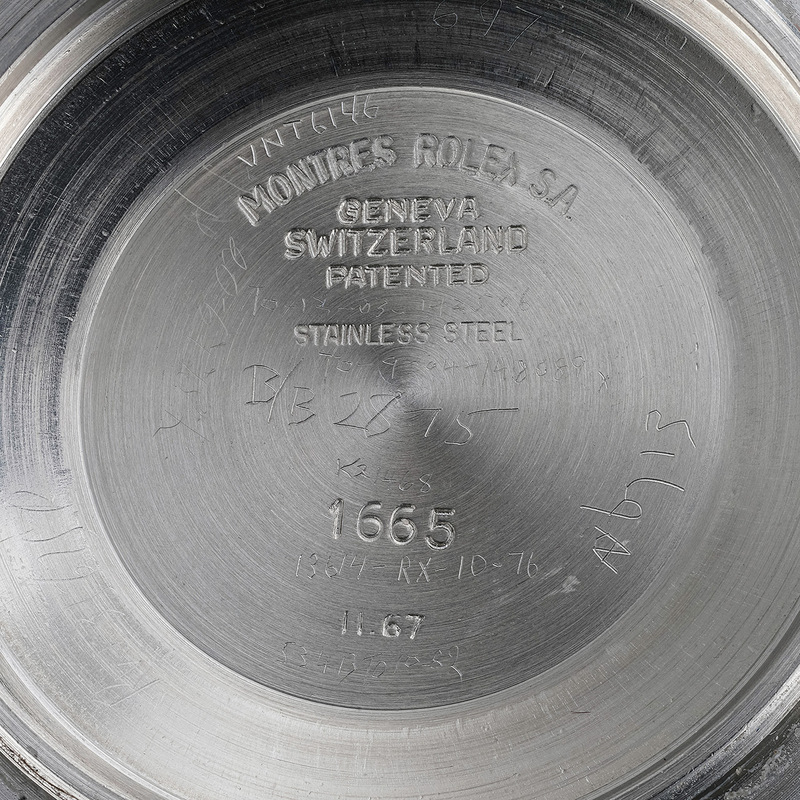 This watch comes with an amazing provenance. The original owner of this ultra rare beast was none other than the famous Deepstar 4000 pilot Robert Palmer Bradley, short Bob Bradley. R. Frank Busby, the author of “Manned Submersibles”, dedicated his book to Bob Bradley. 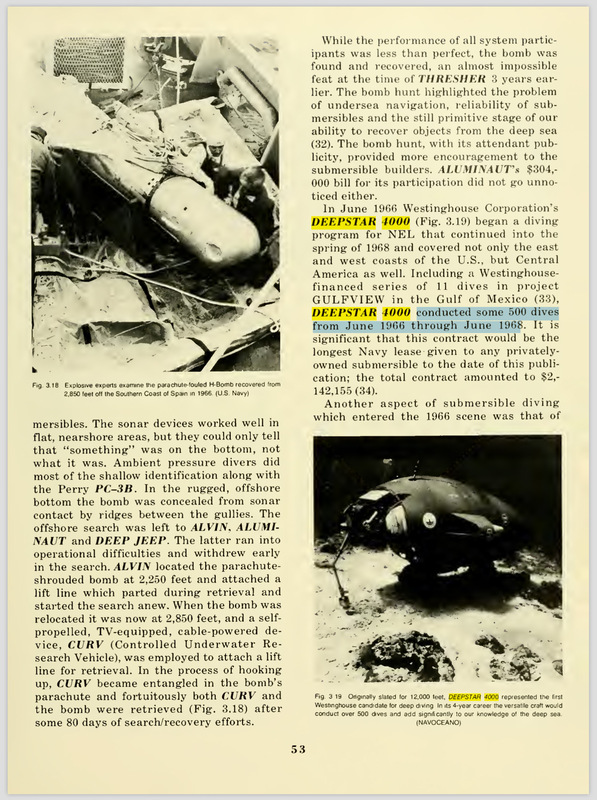 “Manned Submersibles” is considered to be the bible of manned research submersibles. 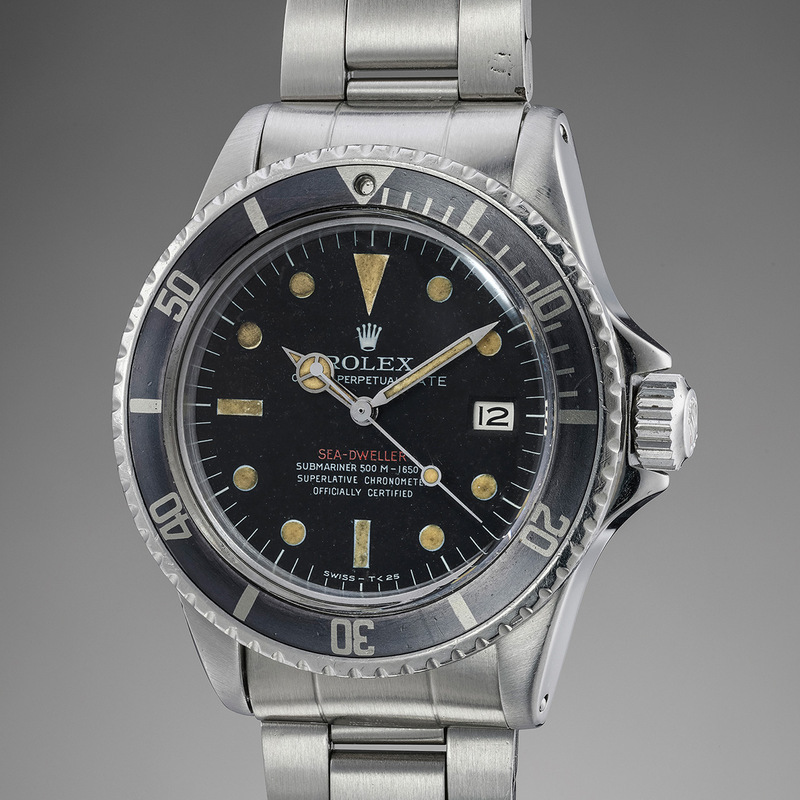 This historically important professional Rolex diving tool watch was published in two of John Goldberger’s books. 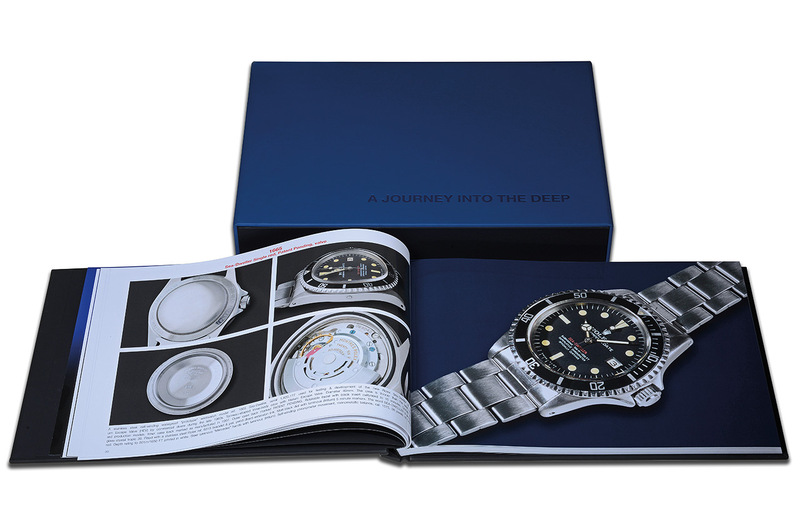 In 100 Superlative Rolex Watches and Goldberger’s latest publication A Journey Into The Deep, which will be available from Dec. 2018 onwards. 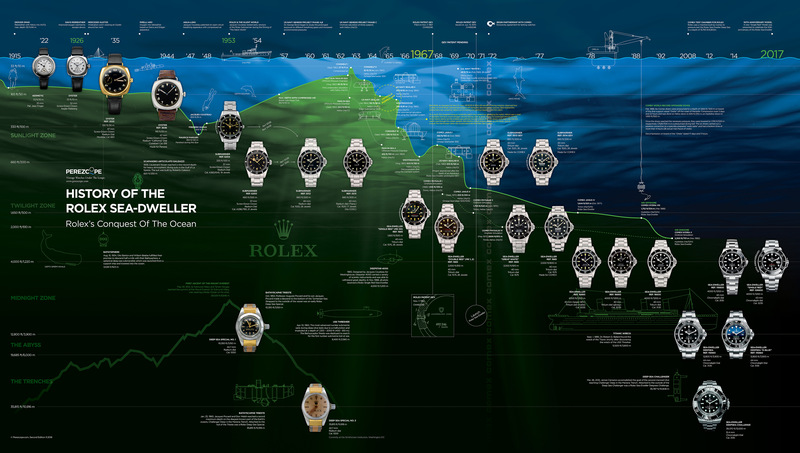 The history of the Single Red Sea-Dweller has not been fully revealed yet but it can be assumed that when the feasibility of putting people for several days on the ocean floor was proven by Jacques Cousteau and Dr. George F. Bond (US Navy) in the early 1960s, Rolex began working on a super diving watch that could withstand even greater depths than the Submariner. The Single Red was an uber Submariner featuring an incredible depth rating of 1,650 ft/500 m. This model was never available to the public. All existing original examples were given to handpicked pioneers in underwater exploration. 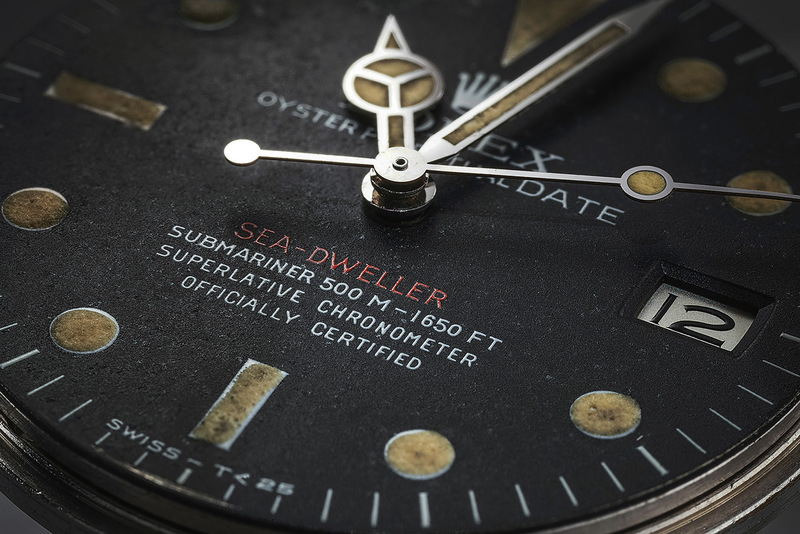 On later batches of the Sea-Dweller – the so-called Double Red Sea-Dweller – the depth rating was increased to 2,000 ft/610 m. It was not until 1971 that the Sea-Dweller was introduced to the public. The next picture shows a detail of Bob Bradley’s Single Red Sea-Dweller Mark 0 dial. Did you notice the “Date” is written in larger letters? The date complication was an important feature of these watches. This dial is simply breathtaking! Diving was no longer just a matter of minutes (max. 5 minutes at 200 ft/60 m), limited by the use of compressed air. In addition, dives beyond 165 ft/50 m were not recommended due to high risk of Nitrogen Narcosis, which would cause divers to lose consciousness and drown. Thanks to new scientific developments and special breathing mixtures, the divers were now enabled to remain at great depths during days or even weeks, while living in so-called underwater habitats. To help them stay connected with life on the surface, Rolex equipped the Sea-Dweller with a date complication. The name Sea-Dweller originated from the very fact that these early saturation divers would literally “dwell” at the bottom of the sea for a prolongued period of time. Saturation diving allows divers to work at deep ocean pressure, down to 2300 feet/700 meters (Comex world record). To do this, divers are placed in chambers which increase the pressure on their bodies until it equals that of the ocean floor. To avoid Nitrogen Narcosis, which occurs at a certain pressure while breathing normal air, the divers are required to breath a special gas mixture consisting of high amounts of helium. Beyond the 1000 ft/300 m mark, hydrogen is added to avoid the High-Pressure Nervous Syndrom. The divers are then lowered to the bottom by a diving bell. When they have finished work for the day, they return to rest in the pressurized chamber. When their work is completely finished, the chamber slowly reduces the pressure (decompression) on their bodies until it again matches the surface atmosphere. During the decompression process in these early stages of saturation diving, it occured that certain watches literally exploded. Helium slowly made its way into the watch through the rubber gaskets during the long stay at the bottom but could not escape fast enough as the watch went through the decompression process, thus expanding within the watch and causing the crystals to pop. The inception for the Single Red Sea-Dweller began before the watchmakers became aware of these issues. Bob Barth was one of the US Navy pioneers in saturation diving. When he became aware of this problem around 1964/65 during SEALAB 1 & 2, he came up with the idea of a one-way valve, which would release the trapped helium gas. 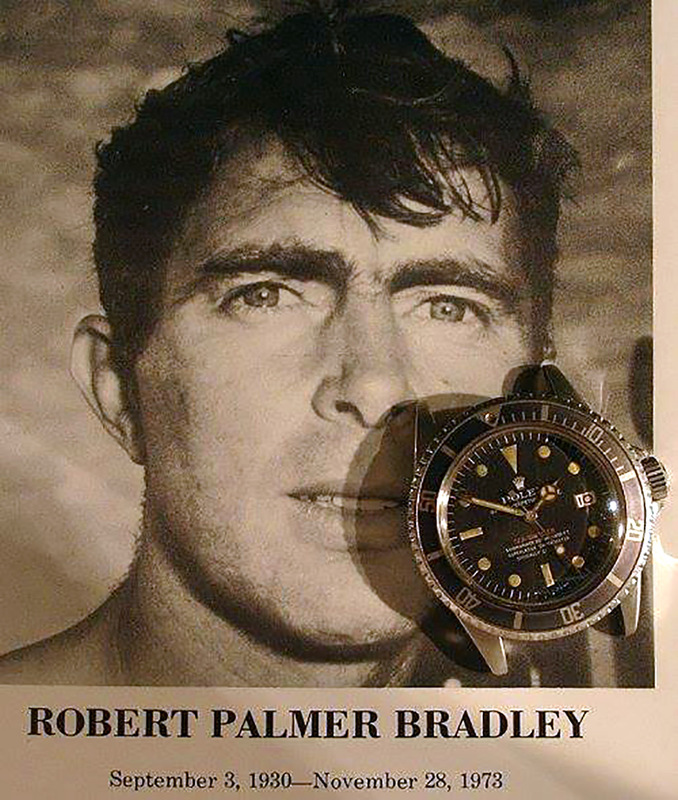 His idea reached Rolex in Geneva via T. Walker Lloyd, who was a diver buddy of Bob Barth and as a result of this episode was offered a job as oceanographic consultant at Rolex. The gas escape valve was a quick fix that saved Rolex from the pain of having to develop a completely new watch. Omega on the other hand, who started working on their own super diving watch around the same time, developed a completely new concept which did not require a valve. The crystal was “clamped” between the watch case and the bezel. It is said that Omega’s so-called Ploprofs (Plongeur Professional = professional diver) were also air-tight, apart from water-tight, and thus not letting helium in in the first place. 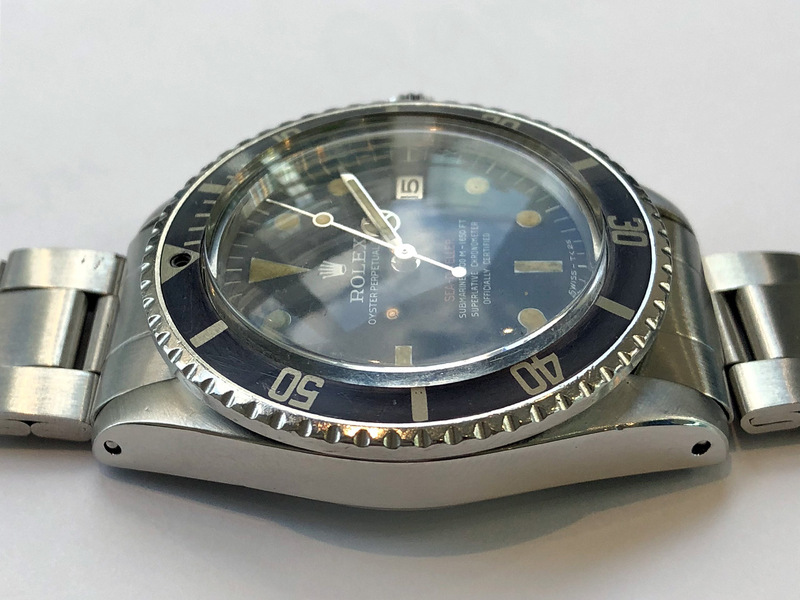 Coming back to the Rolex Single Red Sea-Dweller, some of the surfaced examples do have a valve, but the majority do not. Bob Bradley’s Single Red is one of the watches without valve. Bob Bradley was born on Sept. 3, 1930. As a young man, he enroled in the US Navy and became a jet fighter pilot. Bob was stationed on US Navy aircraft carriers and travelled to globe for several years. During his years in the Navy, Bob developed a passion for scuba diving. In the late 1950s, Bob was promoted to flight instructor at the Naval Air Station in Corpus Christi, Texas. During a late-night exercise, he got involved in a mid-air collision when his aircraft was hit by one of his students from behind. Bradley tried to keep control of his jet but due to the severe damage, he was left with no other option but to eject the plane – at a speed near Mach 1 (speed of sound). Bob’s right shoulder was badly damaged and his left hand sprained. Once landed, he could see and hear the search aircraft but was unable to fire flairs due to his injuries. As a result, Bob was only found the next day. Subsequently, the US Navy offered him a desk job but Bob’s pioneer sense of adventure and his deep interest for the Ocean led him to go back to university, where he graduated in Marine Biology. Following his studies, Bob became a diver for the Scripps Institution of Oceanography in San Diego, California. 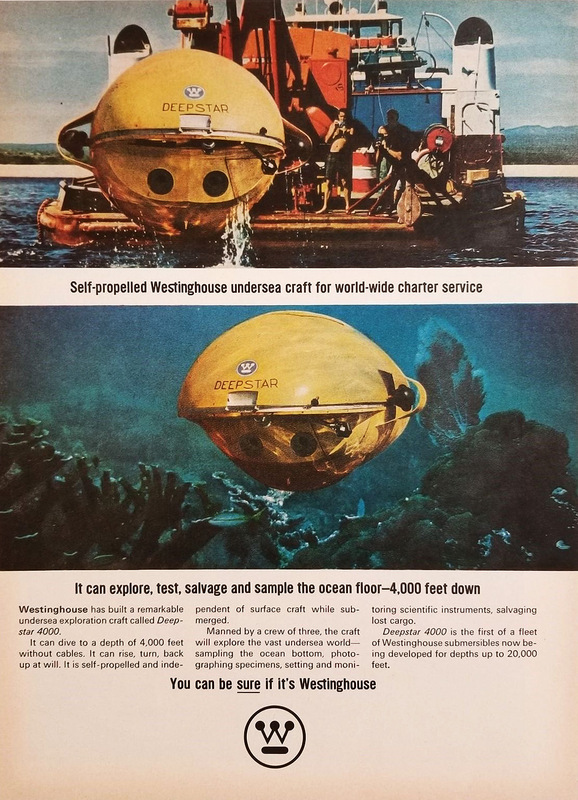 In early 1966, Westinghouse offered Bradley a job as a pilot of Deepstar 4000, a submersible vehicle designed by none other than Jacques Cousteau and built in Marseille, France in joint venture with Westinghouse. With the ability to withstand 4000 ft/1200 m, Deepstar 4000 became the very first commercial vehicle to be US Navy-certified according to qualifying procedures instituted by the Navy in 1966. 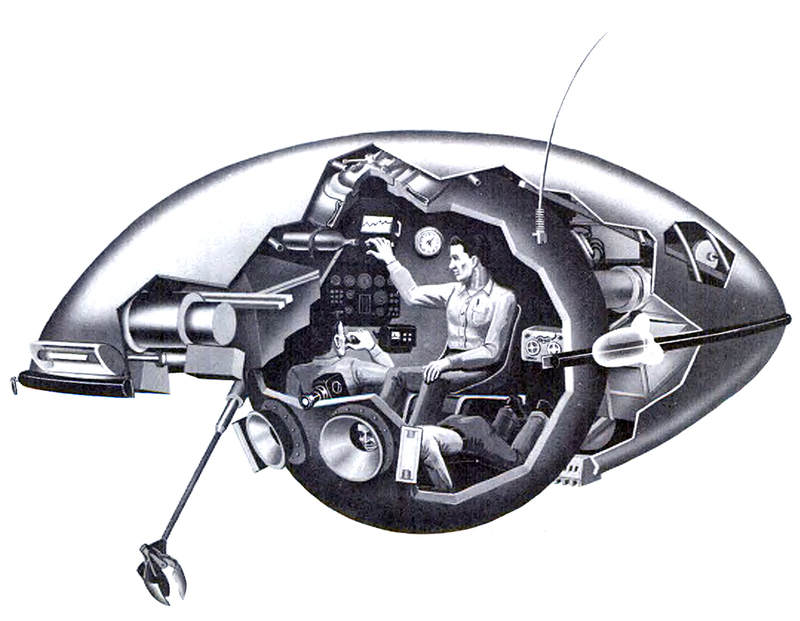 To fulfill its purpose as a deep-sea exploration craft, the manned submersible carried a variety of scientific instruments for taking oceanographic data, including sound velocitymeters, salinometers, water sampling devices, and a coring device. The crew consisted of a pilot and two observers. 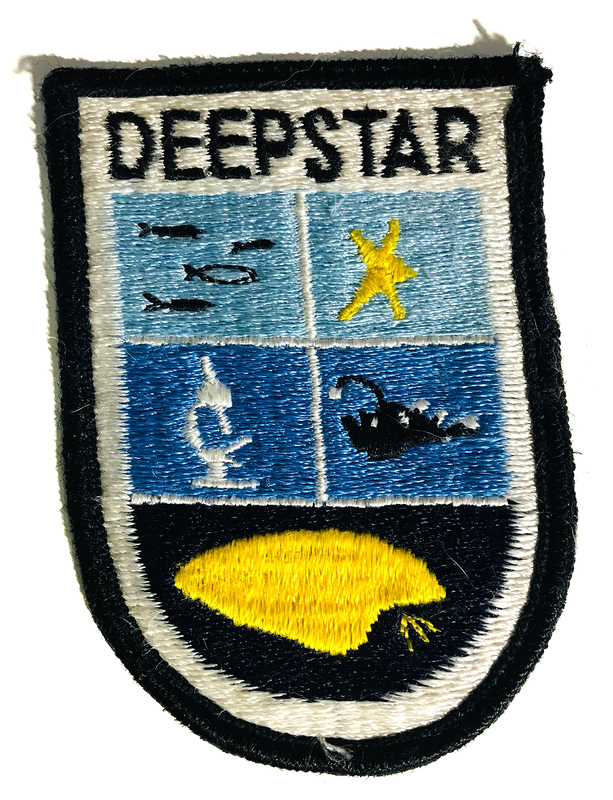 Over the course of time, Deepstar 4000 had a total of five pilots, each specializing in a different area of underwater exploration. Usry, Thompson, Church, Bradley and Adams, all of them were skilled divers and all were handpicked by Jacques Cousteau. It is said that Bob Bradley and Jacques Cousteau were close friends and worked together on numerous projects. 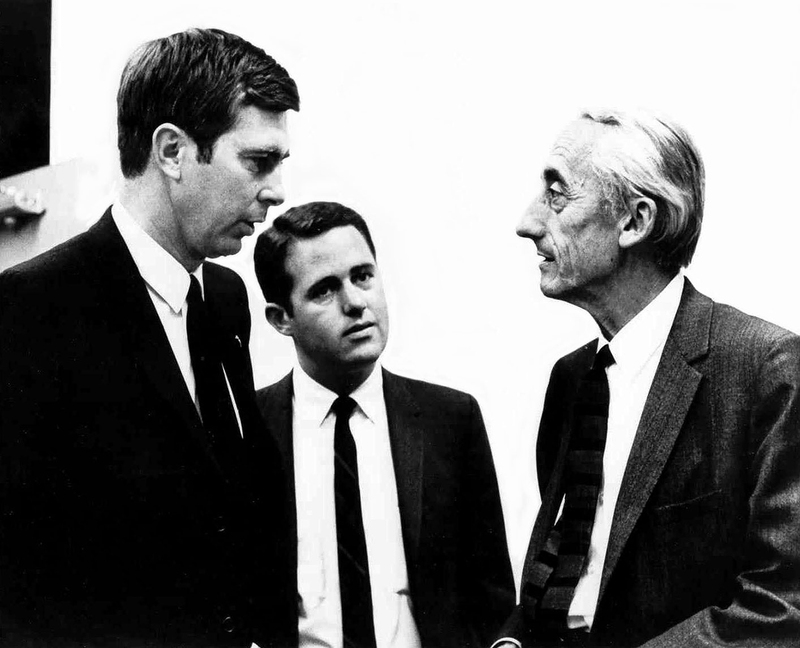 The picture below shows Bob Bradley with Terry Thompson (center) and Jacques Cousteau. 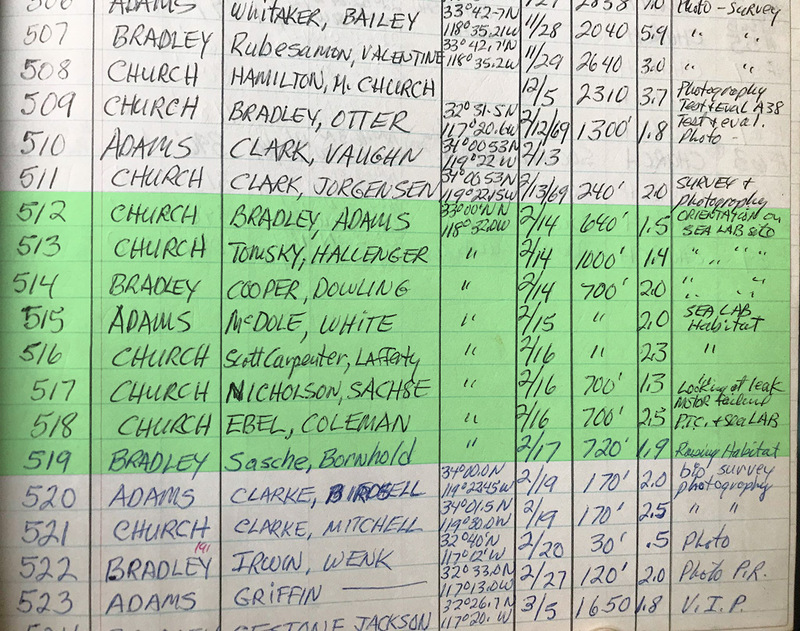 I was able to get in touch with Ron Church’s daughter, Tani Church, and she provided some her father’s Deepstar 4000 logbook pages. 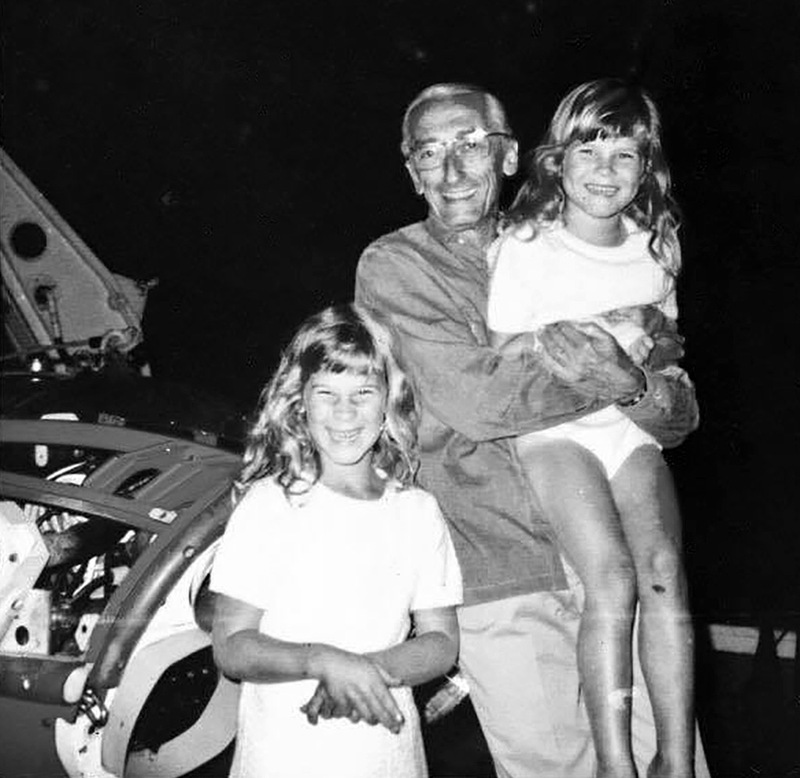 The following picture shows Tani Church and her sister Rondi together with Jacques Custeau on the famous Calypso. Tani is the one in Jacques Cousteau’s arms. 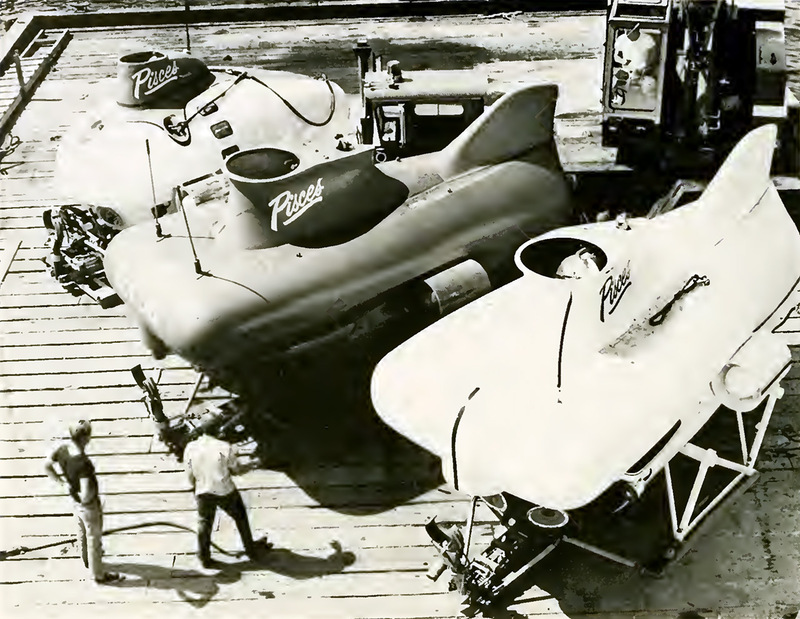 Behind them is another of Cousteau’s submersibles, the SP-500 aka “Sea Flea”. 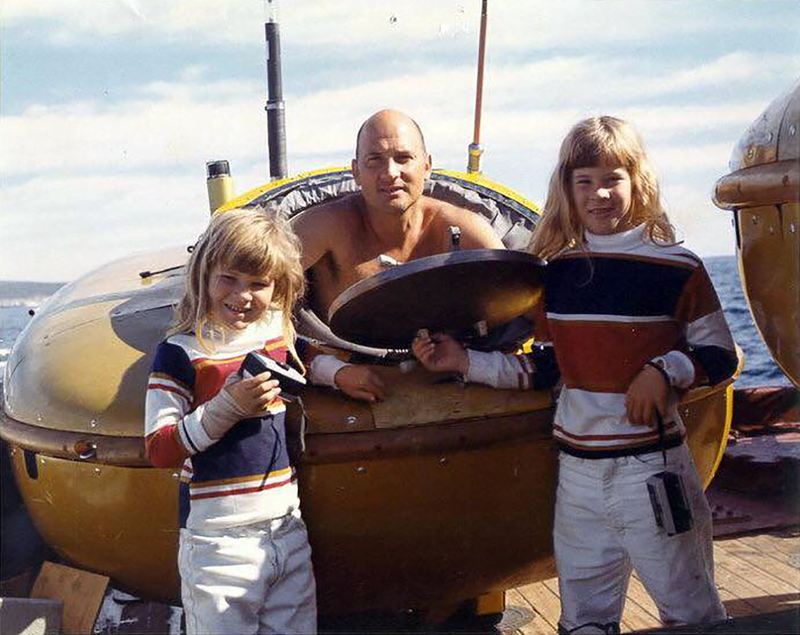 The picture below shows Ron Church inside the SP-500 “Sea Flea” and his two daughters standing next to the mini submersible. Ron Church was a pioneering and award winning underwater photographer. 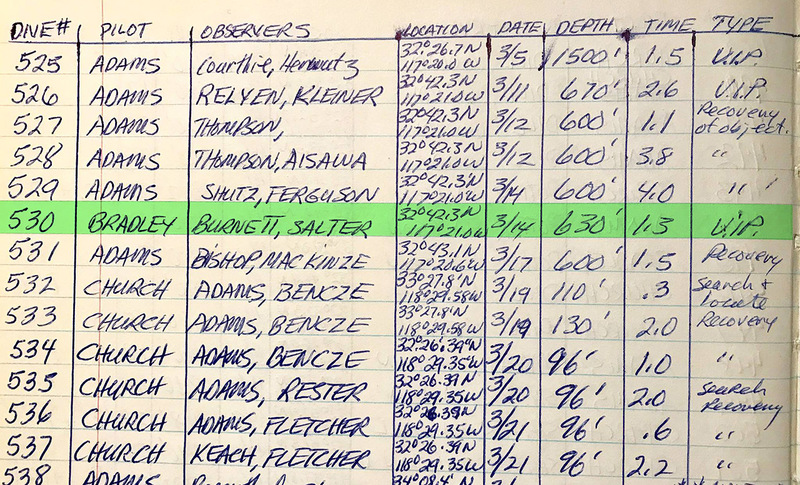 In Ron Church’s logbook, the information related to the first dives of Deepstar 4000 is incomplete. His records start with dive #30 which was piloted by Jean Mollard, Jacques Cousteau’s chief engineer. Bob Bradley is first mentioned in dive #60 from April 1966. This was probably the date when his pilot training started. He was instructed by Dallas Bickett Usry, the first pilot of Deepstar 4000. Usry had spent an entire year in Marseille, France, during which Deepstar 4000 was built. 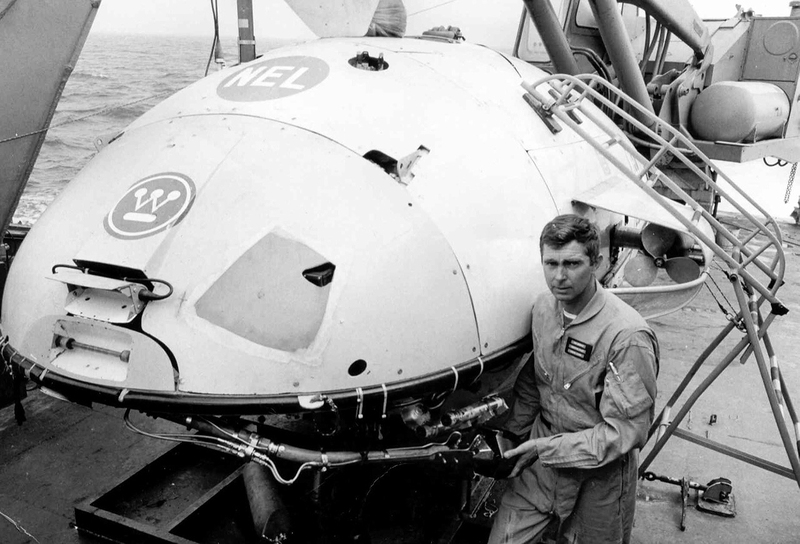 Bradley’s first recorded dive as pilot of Deepstar 4000 was dive #90 on June 17, 1966. This was probably Bradley’s practical test with Usry. On June 30, 1966, during dive #98, Bradley was already able to pilot Deepstar 4000 without his instructor. 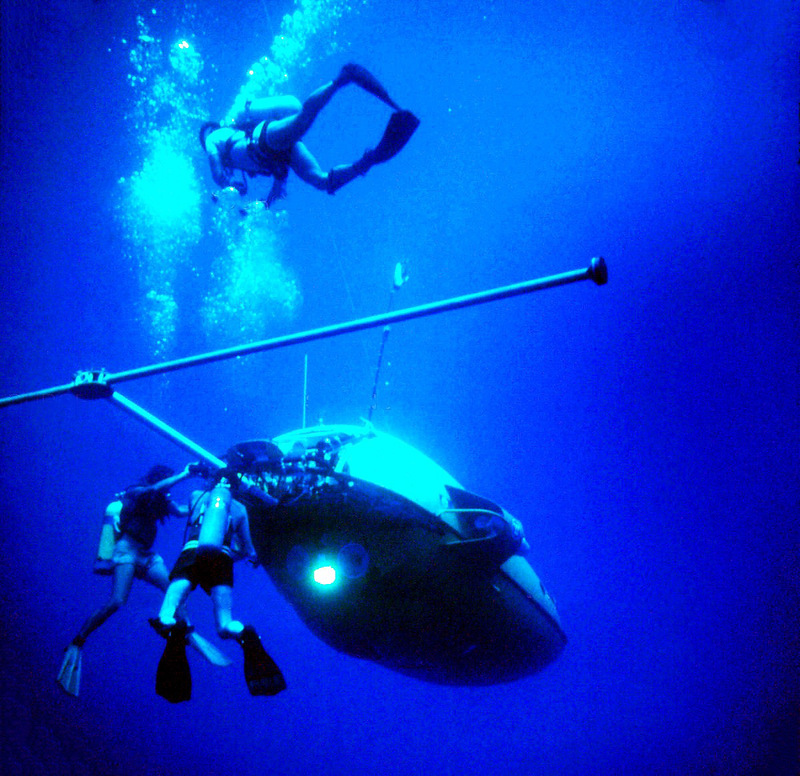 The photo below shows Bradley inside the Deepstar 4000 submersible. 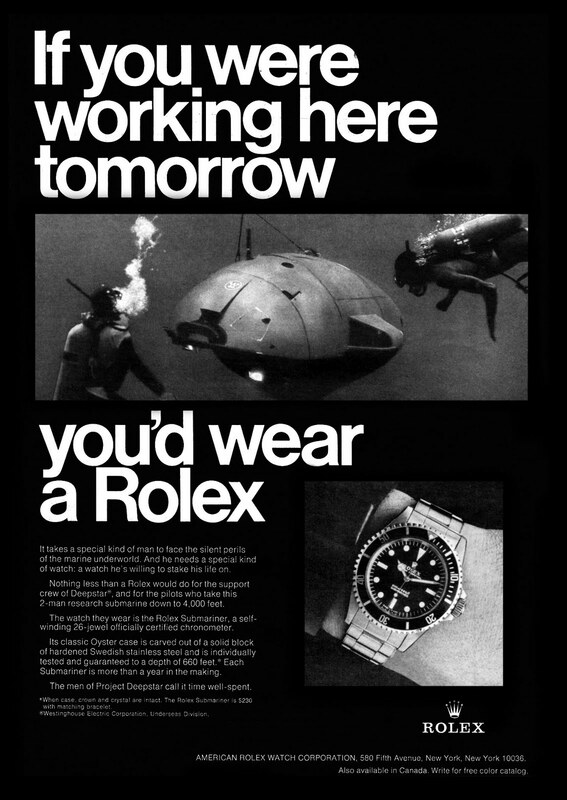 The Deepstar project was so groundbreaking, Rolex mentioned it in one of their Submariner advertisments from 1968 (according to Jake Ehrlich from RolexMagazine.com). Bob Bradley is possibly one of the divers in this picture. This ad refers to the Rolex Submariner as the Sea-Dweller had not been presented to the public yet. The next photo shows Bob Bradley next to Deepstar 4000. Note the “NEL” logo. NEL stands for Navy Electronics Laboratory (now the Naval Undersea Center). 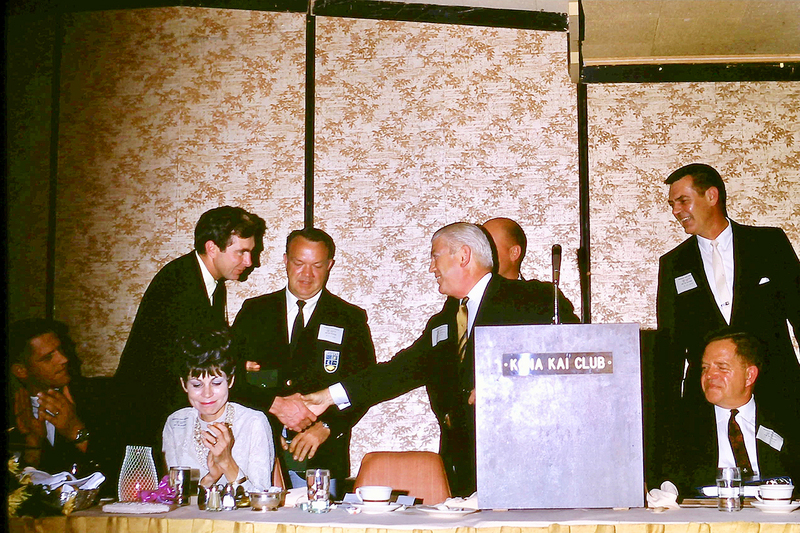 In Nov. 1968, during a ceremony to commemorate the 500th successful dive of the Deepstar 4000 submersible at the famous Kona Kai Club in San Diego, Westinghouse and Rolex USA presented the Rolex Single Red Sea-Dweller to Bob Bradley. The picture below captured the very moment Bob was handed over the green Rolex box. This picture was provided by Bob Bradley’s son Mark Bradley. Ron Church is also present in this picture. He is the guy behind the man handing Bradley the watch. According to Ron Church’s records, Deepstar 4000 had three active pilots at that time. Ron Church, Bob Bradley and Kirt Adams. Dallas Bickett Usry, the initial pilot, had left the project months before. The other two guys standing in the back are Kirt Adams and possibly Thompson. It can be assumed that all remaining pilots received a watch during the ceremony. Kirt Adams, who was standing between Bradley and the man handing the watch, had a Deepstar 4000 fabric patch sewn onto his jacket. Tani Church sent me the following picture of her father’s original patch. The following picture shows the complete crew of Deepstar 4000 on June 18, 1966. The older man (third from left) is the famous American broadcast journalist Walter Cronkite aka “The most trusted man in America”. Cronkite was a Deepstar 4000 passenger on dive #91. The caseback of Bradley’s Sea-Dweller was engraved with his name and the date of the 500th dive of Deepstar 4000: Nov. 08, 1968. These watches were equipped with a Rolex 1570 caliber. 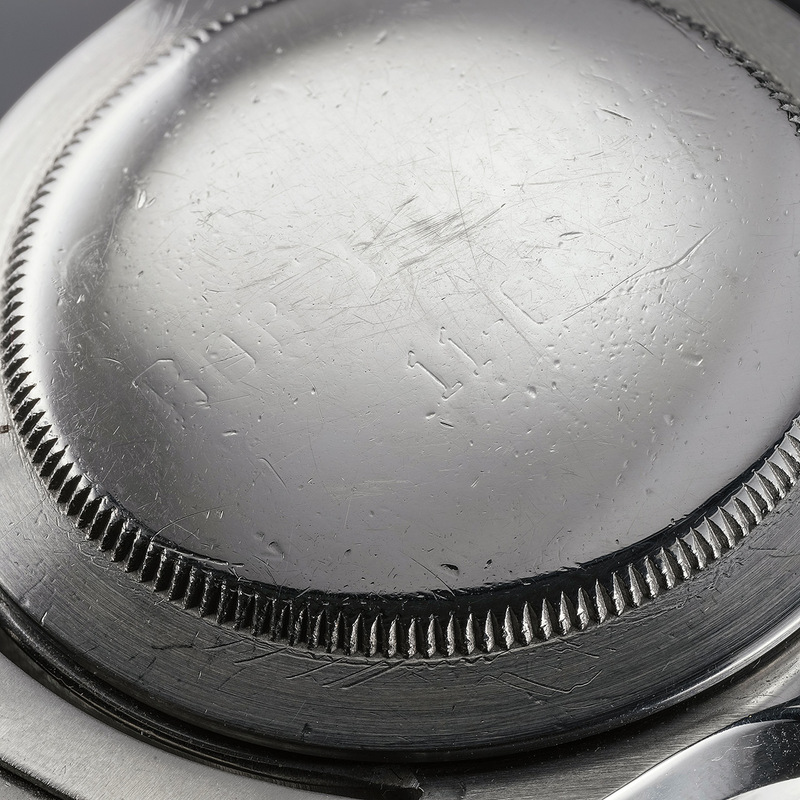 The inside of the caseback bears the typical Rolex hallmarks. II.67 refers to the second quarter of 1967. The many watchmaker marks show that the watch was regularly serviced. 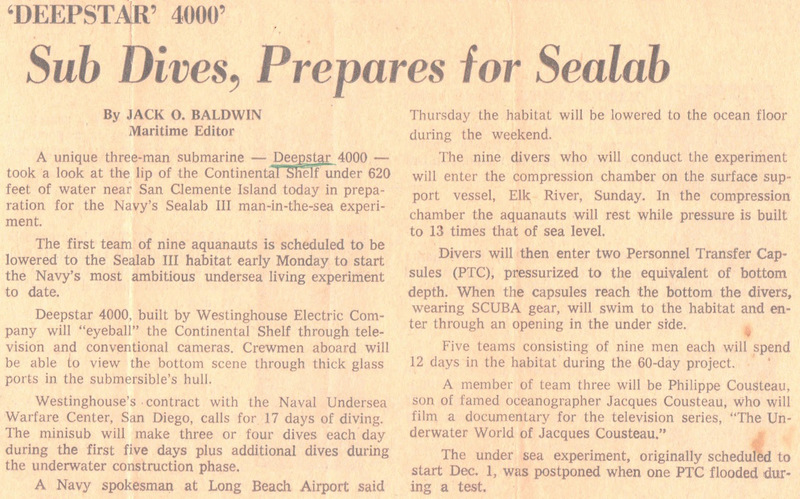 Jake Ehrlich from RolexMagazine.com found this amazing footage from February 1969, where Deepstar 4000 was used to observe the final stages of the lowering and actual touch down of the SEALAB 3 habitat on the ocean floor off San Clemente Island, California. Deepstar 4000 is mentioned at 15:17. Just click play and the video will start right there. 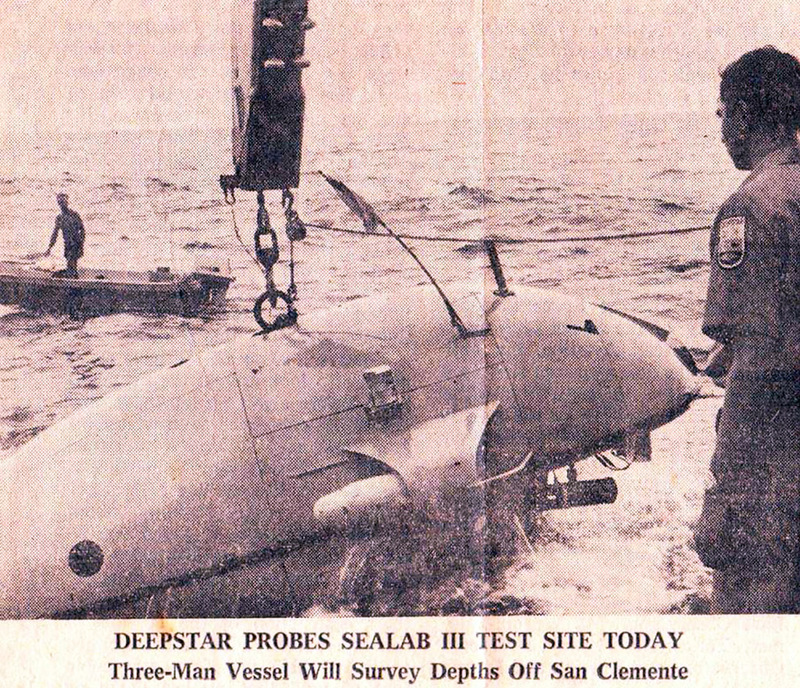 The presence of Deepstar 4000 at the site of SEALAB 3 is further evidence that in those early days of saturation diving, teams of SEALAB, Jacques Cousteau and Westinghouse were closely working together. The person in the newspaper photo below is Bob Bradley. Jacques Cousteau’s son, Philippe Cousteau, was also a crew member of SEALAB 3. 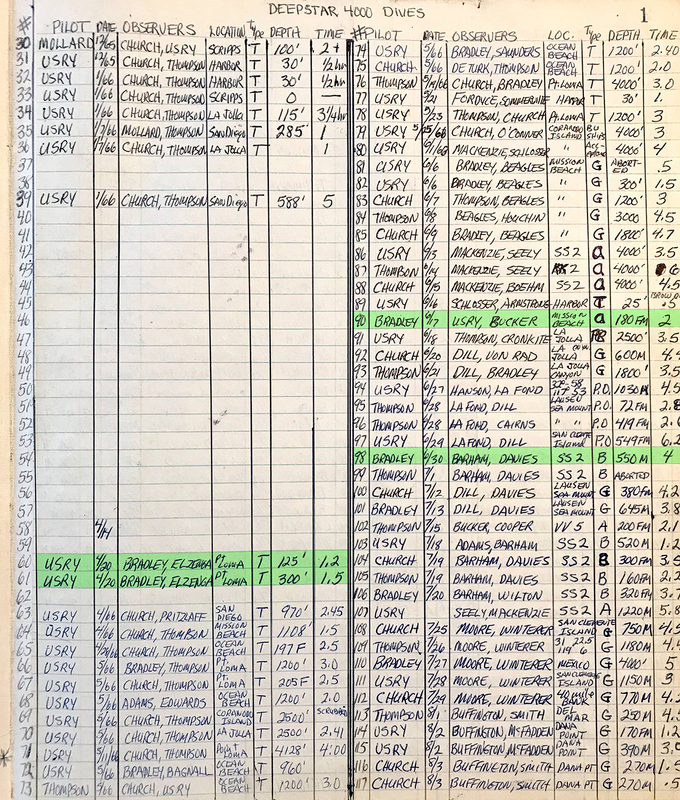 Ron Church’s detailed records show the initial three dives (#512 – #514) that were conducted on Feb. 14, 1969, served to familiarize with the environment in which the habitat was to be lowered. The three Deepstar 4000 pilots Church, Bradley and Adams went down first. On-scene SEALAB 3 commander Jackson Maxwell Tomsky was a passanger on the second dive. 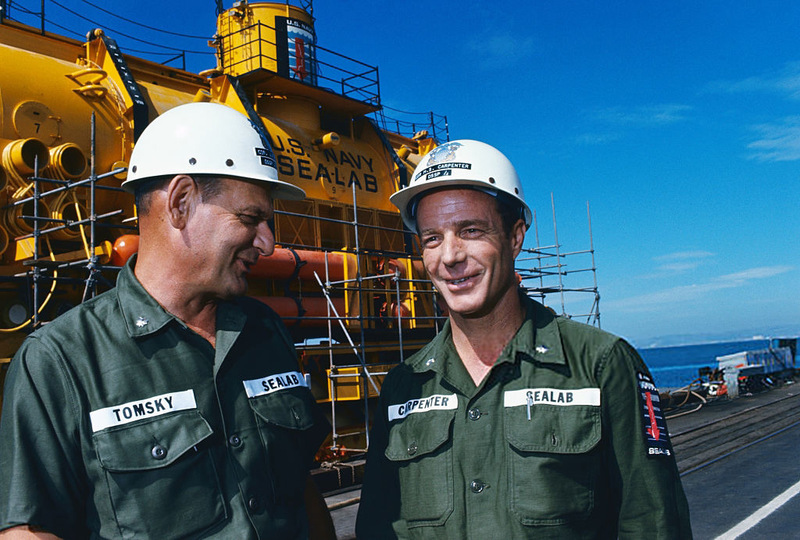 The next picture shows commander Tomsky together with deputy Scott Carpenter in front of SEALAB 3 in the San Francisco Bay Naval Shipyard, before the habitat was towed to Long Beach, California. Commander Tomsky’s Rolex Submariner 5513 with SEALAB 3 engravings was auctioned by Bonhams in Dec. 2015. 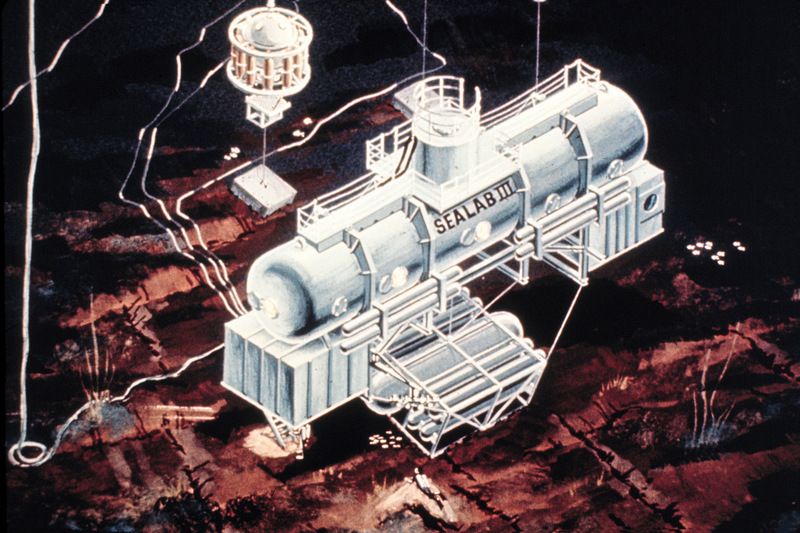 SEALAB 3 was lowered to the seafloor on Feb. 15, 1969. Deepstar 4000 descended to the bottom, permitting the two SEALAB passengers Lieutenant Commander McDole and White to observe the final stages of the lowering and the actual touch down. 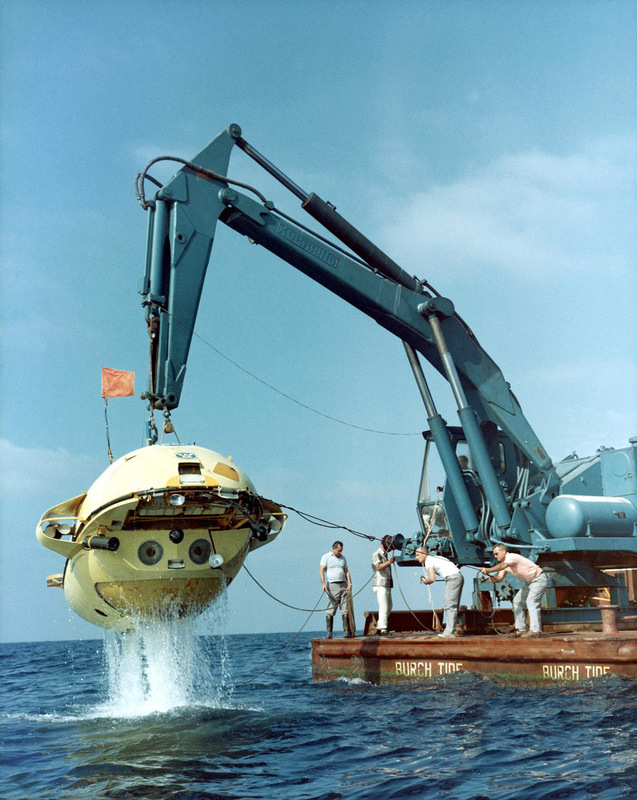 Scott Carpenter, the famous astronaut who had become an aquanaut, was a Deepstar 4000 passenger on dive #516 which took place the day after the habitat had successfully been lowered to its final position. The second passenger on this dive was Lt. Cyril Lafferty from the British Royal Navy. At some point during the morning hours, pressure inside the habitat began to drop and it was determined that gas was leaking. 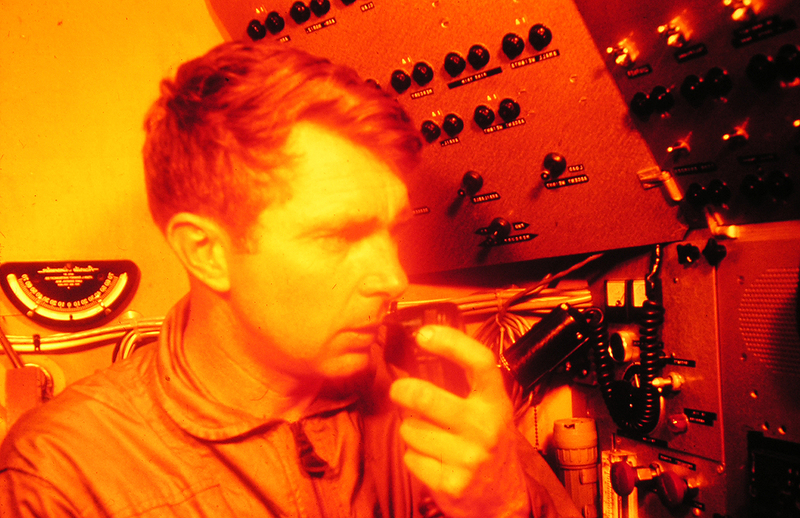 Captain William Nicholson, head of the Navy’s Deep Submergence System Projects and overall leader of the SEALAB 3 project went down on dive #518 in order to see for himself how severe the problem was. Captain Nicholson had a appearance in the SEALAB 3 video shared on Youtube. Click play to start the video at 28:17. 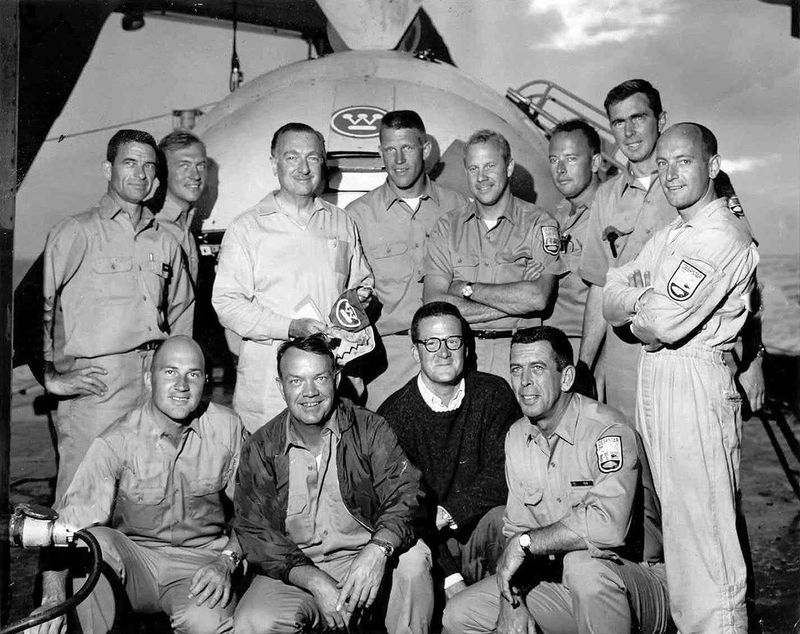 A team of four aquanauts – among them experienced SEALAB veterans Bob Barth and Berry L. Cannon – were immediately pressurized and sent down to stop the leaks. During the second attempt at saving the habitat, Berry L. Cannon died due to a malfunction of his breathing apparatus. The habitat could not be saved and SEALAB 3 was aborted. Bob Bradley piloted the final SEALAB dive #519 of Deepstar 4000 during which the complicated procedure of raising of the habitat from the seafloor back to the surface was observed. A few month later, Deepstar 4000 and its pilot Bob Bradley were mentioned in a newspaper article from June 8, 1969. Oceanographic research, in developing the deep diving submersible, also has produced the world’s quickest cure for sea-sickness. Seconds after the undersea craft drops away from the surface, wave motion ceases and that queasy feeling is forgotten. There is no sense of motion as the Deepstar—4000 descends in a spiral on its way to the ocean floor. Only the flow of sea life past the viewing ports reveals the craft’s progress. At 100 feet, the water is blue green. Visibility is limited by sea life and other matter. The color turns to dark green at 200 feet. At 300 feet, the darkness is complete. It’s no place for a fat man or a claustrophobiac. THE DEEPSTAR 4000, a three-man diving vehicle capable of depths up to 4000 feet, is launched from its support ship at San Diego. 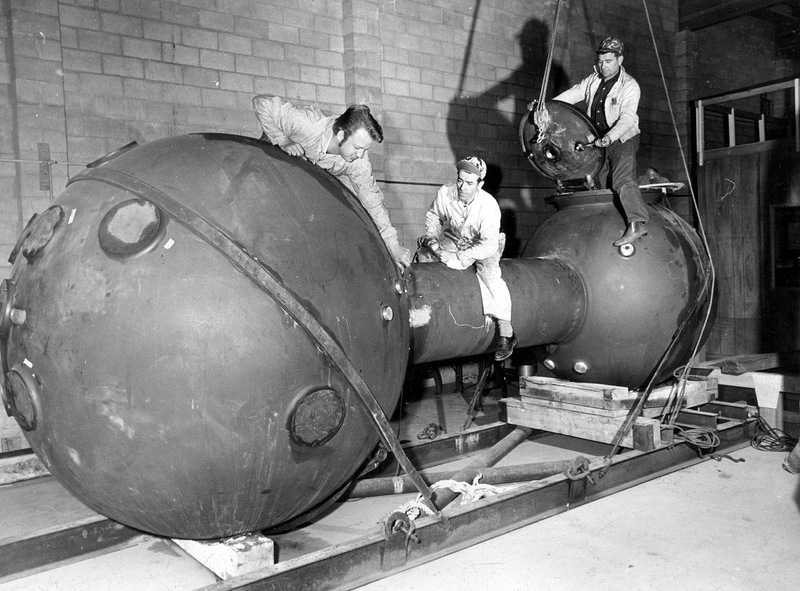 The crew compartment, a seven-foot steel ball, is crammed with electronic equipment, oxygen tanks and other machinery. Add three persons and the situation becomes cozy. 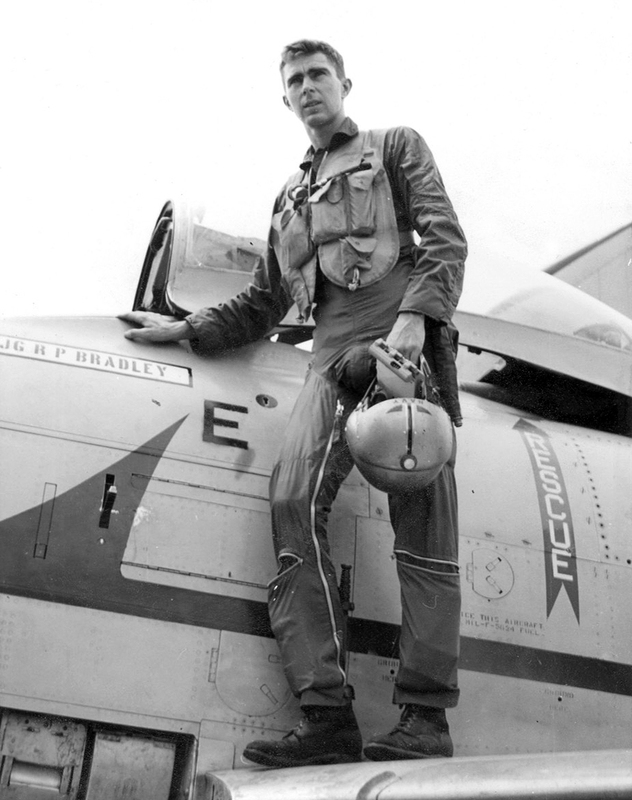 Pilot Bob Bradley slowed the craft’s descent as it neared the bottom at 600 feet. The ocean floor loomed, through the murky water. The gray, flat bottom stretched out into the darkness. Huge sea anemones stand like ghostly white palms in a desert of mud. “There’s no plant life below 200 feet because of the lack of sunlight,” Bradley explains. Fish, too, were few. Thoughts, primarily concerning the presence of 600 feet of water overhead, flit through the mind. “It’s a good place to get away from the smog.” commented Bradley. Evidence of man’s passage was evident, even several miles from shore. A white bowl, pipes, machinery, cables, buckets and other junk from passing ships littered the bottom. The Deepstar, developed by Westinghouse, is capable ot dives to 4,000 feet and has made more than 500 operational dives. It has an oxygen supply good for 48 hours and numerous safety devices designed to get it back to the surface in case of problems, information of comfort to the neophyte voyager to the bottom of the sea. Robert M. Burnett’s dive with Bob Bradley mentioned in above newspaper article is absolutely consistent with Ron Church’s records. The dive took place on March 14, 1969 off the coast of San Diego at these specific coordinates: 32°42’3N, 117°21’0W (Google Maps). After his time at Westinghouse, Bob became as a submersible pilot for International Hydronamics, a company founded by three commercial divers in Vancouver, Canada. Their submersibles of the Pisces class were specially built for the rough conditions of the Arctic and North Sea. 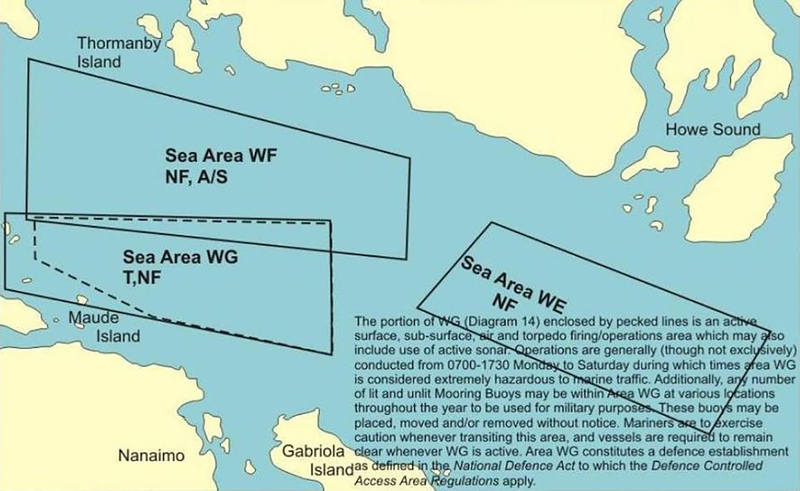 International Hydronamics had contracts with the US Navy as well as the Canadian Navy to retrieve lost torpedos in the Whiskey Golf Area test firing range near Vancouver Island. Bob Bradley’s job was to run these operations. Bob Bradley later started his own company named Arctic Marine, also in Vancouver. 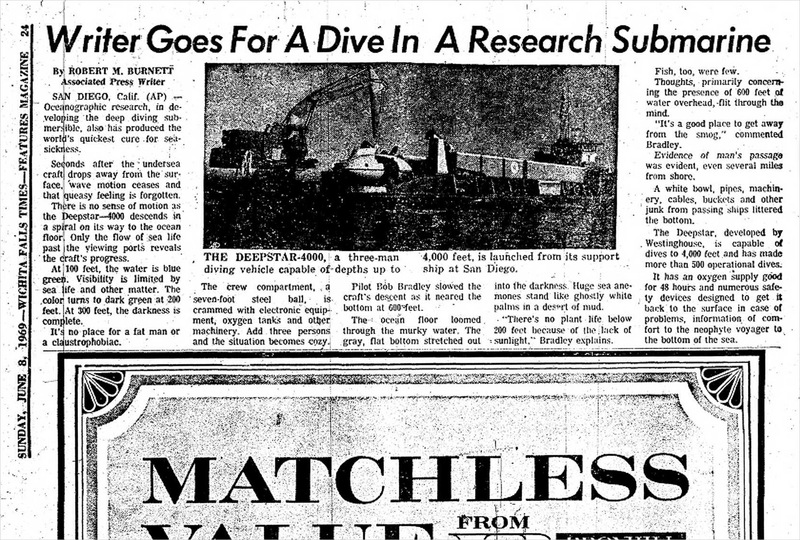 He reconfigured an existing submersible named Paulo 1 into the Sea Otter, a submersible capable of descending to 1500 feet. 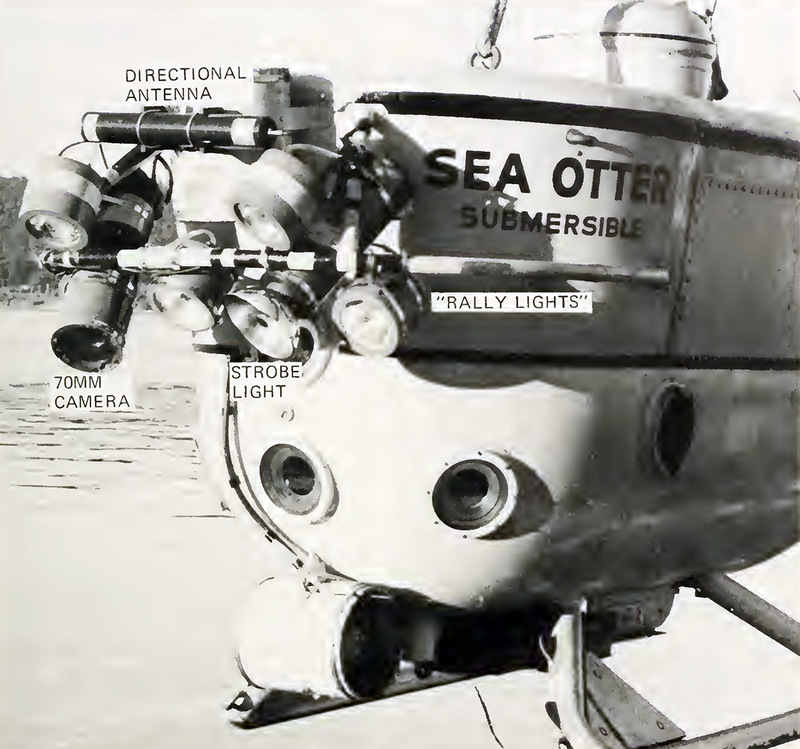 In early 1972, the Sea Otter was finally ready to be deployed for its first serious mission. In 1973, Bob Bradley acquired the salvage rights for the “Squamish Chief”, a tugboat that had sunk in the Douglas Channel near Kitimat in British Columbia, Canada. Bob Bradley saw this as a great business opportunity. The wreck was located at a depth of 500 feet. Bradley’s salvage plan forsaw connecting a tow line to the tugboat’s bollard with the Sea Otter and then have it dragged by tugboats along the ocean floor into shallower waters, where it would then be lifted from the ocean floor with a large crane barge. The operation took around 3 weeks and 17 submersible dives. After the tow line was attached, the wreck was dragged to a depth of 219 feet where the line parted. With expenses accumulating rapidly, Bradley decided to attempt lifting the tugboat where it now sat. At this depth, Bradley felt comfortable doing scuba dives to attach four lifting cables from the crane barge. On his first dive, he was able to hook up three of the four lifting cables. There were problems with the fourth cable. Bradley dove a second time but never surfaced. It was not until the next day that his body was recovered. The “Squamish Chief” was brought to the surface the following day with just the three lifting cables. 200 feet is a dangerous depth for diving with compressed air. It is the realm of Nitrogen Narcosis, an intoxicating effect caused by breathing nitrogen under pressure. Bob Bradley was an experienced diver with many dives exceeding 200 feet and he was well aware of the risk. According to Mark Bradley, Bob Bradley’s son, his father was wearing another dive watch that day, since his trusted Sea-Dweller was being serviced. That watch flooded during the first few minutes of the dive. This unfortunate circumstance probably led Bob Bradley to think he had more bottom time left, where in fact, he had already exceeded that time. “Had I the chance to peel away the years and once again decide which path to follow, it would be towards the sea. I would do this for two reasons: Because it is a most intriguing subject and the most intriguing people are met on and under its surface. Bob Bradley was, what I can only call, a delight and a rare privilege to know. He possessed a sharp, sly sense of humor, a pioneer’s sense of adventure and displayed a scholar’s interest in the oceans. Naval aviator, commercial diver, submersible pilot and graduate in marine biology are not credentials one would expect from a son of the prairies. But in a quiet, certain, almost casual manner, Bob dealt as easily with the deep oceans as he would have the wheatfields of his native Kansas. He was quick to befriend, perhaps too quick, for the waters he felt he knew and understood claimed his life at 219 feet in Douglas Channel, British Columbia. I miss him: so do other friends he left. In a very real sense, an earlier pioneer of the deep oceans. William Beebe described our loss. I think this speaks for itself. The importance of this diving tool watch cannot be stressed enough. A collectible of this caliber belongs in the most exclusive watch collection. If you are interested in further information about these amazing watches, in August 2017, I put together all Rolex Single Red Sea-Dwellers I could find. The Rolex Single Red Sea-Dweller plays a central role in the history of professional Rolex diving tool watches. The following infographic shows this model in its historical context. Limited: 50 pieces, numbered and signed by Bob Barth, the legendary US Navy Aquanaut who pioneered saturation diving during the famous SEALAB missions. 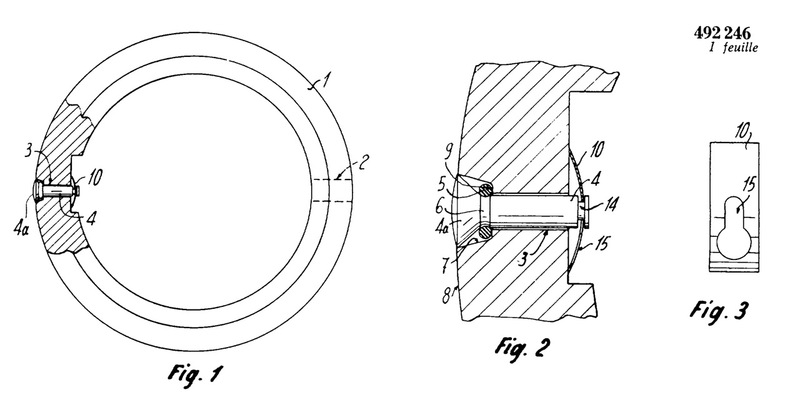 Bob developed the idea for the Rolex Gas Escape Valve: EUR 350.00 (plus shipping). A part of the selling price goes directly to Bob. Just finished setting up a brand new database for Rolex Ref. 6538 “Big Crown” with strong focus on Cal. 1030 movement numbers. The beauty of data is, it never lies and exceptions only prove the rule. My name is Mark Bradley. My father was Robert Palmer Bradley. I just came across your article tonight. I have to say it is amazing. Most of it I am aware of and even supplied my brother Chris with some of the photos that are in your article. 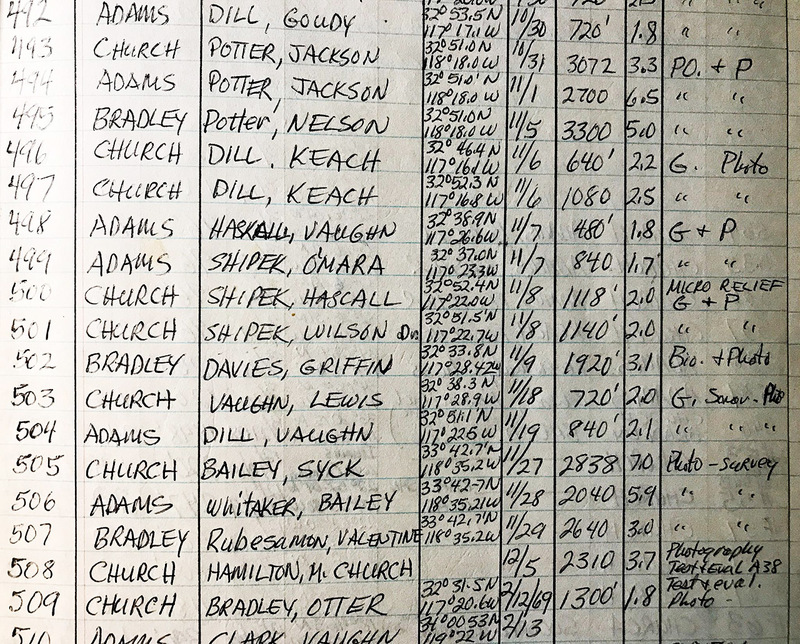 The dive logs from Ron Church I’ve never seen before and loved seeing them. Thank you for such a wonderful article. Really brings back memories for me. It amazed me when I found out what his watch was worth. I think my brother Chris still has night-mares abut selling it. Hi Mark, thank you for your comment. Pls check your email and also your spam folder.